Commercial locksmith in Michigan employing technology in our business. The word locksmith may be an old word but the services are certainly the opposite. A modern commercial locksmith in Michigan uses locks or security devices that utilize access control system technology. These security devices are equipped with smart electronic systems and machinery. Good examples are biometric scanners. These tools make it even harder for thieves to breach your security. A commercial locksmith in Michigan is one of the most important things that business owners should look for if they are starting an enterprise. Investing in a business is not a petty matter. Therefore, business owners must ensure that there are no risks or threats posed on their ventures. It is just reasonable to reinforce the security in the business premises. 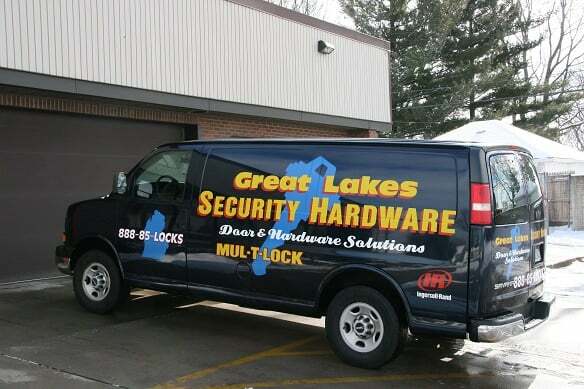 None can do this job better than Great Lakes Security Hardware commercial locksmiths in Michigan. We do not just provide and install high-quality locks. Their services include studies about the commercial structure, its passages, the location and security lock maintenance. As a commercial locksmith in Michigan we survey the commercial structure to determine how many entrances are used. This way, we can determine the required level of security as well as the types of locks that are used. The passages of the business structure will tell us how people go around the area. This information is useful especially during closing time because the knowledge allows business owners to systematically close and secure the business premises. Ultimately, there will be no doors left unlocked. The location plays an important part in providing security for businesses. It has many things to do with the demographics and general culture of the people in the area. This information is used to identify the possible scenarios of theft break-in. Having this foresight allows us your commercial locksmith in Michigan to prevent theft attempts. Moreover, a commercial locksmith in Michigan evaluates the current security system of its clients’ business properties. This helps commercial locksmiths in Michigan determine if the current security scheme is still effective. If not, the commercial locksmith service provider will suggest steps on how to improve the safety of the business. A commercial locksmith service provider will also look at the locks and the keys periodically. If the locks are no longer functioning at its peak or the keys have worn out, the service provider will have it replaced. That is because they understand that a business owner cannot risk losing his investments to thieves by a rusty lock and a worn out key. A reputable commercial locksmith in Michigan will provide these services for your security and satisfaction.